Today during Berklee College of Music’s graduation, Matt Glaser nudged me and shared somber breaking news: “Johnny Gimble just died.” In a split second, the world became a little less swinging. 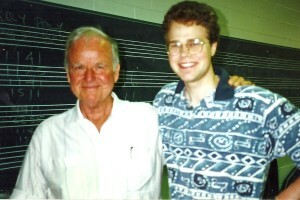 Johnny Gimble and David Wallace; Waco, TX; July, 1996. Note “Roly Poly” chord progression on the blackboard in the Nashville number system. Johnny Gimble: legendary fiddler; consummate entertainer; deft bandleader; witty raconteur; kind, generous teacher; family man. Only last week, Matt and some of our string faculty were enjoying and analyzing Johnny’s extraordinary “Beaumont Rag” solo from his “Fiddlin’ Around” LP (Capitol 11301, 1974). Though Johnny would have been tickled to see the joy his solo gave us, he would have shrugged off our urges to canonize it. As he was driving me home in his pickup, my brother said, “Johnny, I’m disappointed in you.” I said, “Why?! I thought I played well tonight!” He said, “Johnny, you played the same solo you played last Saturday.” From then on, I decided to never play it the same way once! I spent many happy hours listening to Johnny Gimble, learning from him, jamming with him, and even teaching by his side at Mark O’Connor’s San Diego String Conferences. Ceaselessly, Johnny amazed me with the freshness of his improvisations and musical ideas. In reality, his fecundity was rooted in an encyclopedic knowledge of Texas swing. He could teach you classic riffs and solos that he had learned from many of his heroes and role models: Cliff Bruner, J.R. Chatwell, Jesse Ashlock and many others. By breaking tricky licks down, he made them simple and accessible. If you did want to learn a tune or a solo note-for-note, he would teach you. Johnny constantly enriched and deepened other musicians’ knowledge. If you loved Bob Wills and the Texas Playboys, he made sure that you also knew Milton Brown and his Musical Brownies. If you admired one particular “Beaumont Rag” solo, he made sure you knew about several others by multiple artists from different eras. Often, he would demonstrate them from memory. When Johnny found out that I also played viola, the first thing he asked me was “Have you heard Don Decker? He played viola in T. Tex Tyler’s band. There aren’t a whole lot of records, but he was really good.” Johnny should know; he was one of the first fiddlers to add a fifth string to his fiddle so that it could encompass the viola’s deeper range. Throughout his career, Gimble also distinguished himself with his voice. Fronting his own bands with lead vocals, he also sang in unison with his improvised violin lines and harmonized fluidly. I can’t recall a concert, class, or jam that didn’t include a healthy dose of Johnny’s singing. Johnny Gimble knew his music theory. More than anything, though, his playing was rooted in his ears and in hours of listening, both on the bandstand and off. We musicians could easily spend the rest of our days studying Johnny’s music, striving for his impeccable rhythmic drive, and seeking to embody his generous, gregarious stage presence and personality. However, in many ways, we would be missing the point. Johnny Gimble strove to be creative, not merely imitative. In full measure, he shared his musical gifts for the joy and the sake of others- not for his own gratification or glory. We should definitely transcribe his solos, teach his licks, and play his tunes. More than anything, though, we should preserve his legacy the way he lived it: jam, sing, laugh, share, teach, and never play it the same way once!